Sea Captain Video Slot Guide & Review - Casino Answers! Sea Captain is a 5-reel, 25-line video slot developed by Realtime Gaming, featuring a wild substitute symbol, scatter wins, multipliers, a free spins feature and a progressive jackpot. You can play the Sea Captain Real-Series Video Slot at USA-friendly casinos Cherry Red Casino and Winpalace Casino. Bets on the Seacaptain slot machine are $0.01, $0.02, $0.03, $0.04, $0.05, $0.06, $0.07, $0.08, $0.09, $0.10, $0.25, $0.50, $1, $2.50 and $5 per line. Use the arrows next to “Bet” to select your bet per line. You can select from 1-25 paylines on a spin. Use the arrows next to “Lines” to select the number of paylines you wish to play. Seacaptain is a penny slot, so you can play anywhere from one cent on a spin up to the highest available total bet of $125 per spin. Sea Captain has a good betting range, great no matter if you are a casual player or high roller. You can manually stop the reels by hitting the “Stop” button during a spin, thus activating the skill stop feature. To play the Seacaptain video slot, hit the “Spin” button. Sea Captain’s wild substitute symbol is the Squid. 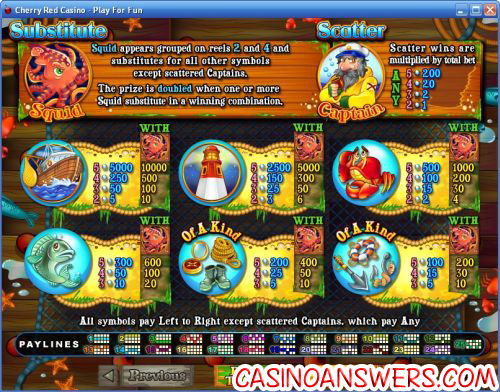 The Squid appears grouped on both reels 2 and 4 and substitutes for all symbols on the Sea Captain online slot except for the Scattered Captain symbol. Whenever the Squid substitutes in a winning combination, your prize will be doubled. The highest paying symbol on the Sea Captain video slot is the Ship symbol. On its own, you can win up to 5000 coins by hitting 5 Ship symbols. If you 4 Ship symbols land on the reels with a Squid substituting for the final symbol, you will win Seacaptain’s top payout of 10,000 coins. The second highest symbol is the Lighthouse symbol, which pays up to 2500X on its own (5000X with a wild symbol). The Captain symbol is the scatter symbol on the Sea Captain slot game. 2, 3, 4 or 5 scatter symbols anywhere on the reels will pay out 1X, 2X, 20X or 200X your total bet. When three or more Captain symbols appear anywhere on the reels, you will win 7 free spins with a 3X multiplier. You may think “that’s not a lot of free spins,” but you will get an additional free spin every time the Captain scatter symbol appears during the free spins feature. We were able to at least double our number of free spins thanks to additional free spins. The free spins feature cannot be re-triggered. Free spins are played at the paylines and bet of the triggering spin. Sea Captain is host to a progressive jackpot that at the time of this writing is at a stunning $27,705. The progressive jackpot is triggered at random, so it can be won at the conclusion of any spin on the Sea Captain slot machine. Progressive Jackpot wins are added to other wins. Random Jackpot contribution is no more than 1.5% of total Return to Player. You can play for the Sea Captain Progressive Jackpot when you play the Sea Captain video slot at Cherry Red Casino! Hit the “Autoplay” button to open the autoplay settings on the Sea Captain slot game. You will be able to set the number of spins, set it to stop when the jackpot is won, stop if a win exceeds or equals (any amount you input), stop on any win, stop if your balance increases/decreases by any amount you input and stop once the feature is triggered. You can stop the autoplay mode on Sea Captain by using the “Stop Auto” button. To speed up the gameplay, simply hit the “Turbo Play” button in the autoplay settings. RTG is able to deliver once again with the Sea Captain video slot. Its presentation is very close to top-notch, if not top-notch. There is no bonus game, but what it does have is a free spins feature with a great multiplier and a huge progressive jackpot. If you hit that progressive jackpot, you won’t be complaining about Sea Captain not having a bonus game! To play the Seacaptain RTG Real-Series Video Slot, sign up and make a deposit now at Cherry Red Casino! Are players from the USA able to play the Seacaptain online slot for real money? Players who are based in the United States of America are free to play the Seacaptain online slot machine at USA-friendly RTG casinos Cherry Red Casino and Winpalace Casino. If you’re located outside the United States, you can also play Sea Captain at King Solomons Casino or read more about King Solomons by reading our King Solomons Casino Review. Can I play a free Flash game of the Seacaptain video slot? RTG only offers certain casino games at its Instant Play casinos. While Sea Captain is not one of these games, you can read our Goldbeard Video Slot Review and play it at Cherry Red Flash Casino and Winpalace Flash Casino. How can I win the Seacaptain progressive jackpot? To win the Sea Captain progressive jackpot, simply spin the reels and hope luck is on your side! The Sea Captain progressive jackpot is a random progressive jackpot, so it can be won any spin you make. To better your odds of winning the progressive jackpot on the Sea Captain slot game, we suggest increasing your bet per line. How do I speed up the Sea Captain video slot? For faster play on the Seacaptain online slot game, hit the “Autoplay” button and check off the “Turbo Play” option. You don’t have to turn autoplay on to use the Turbo mode. 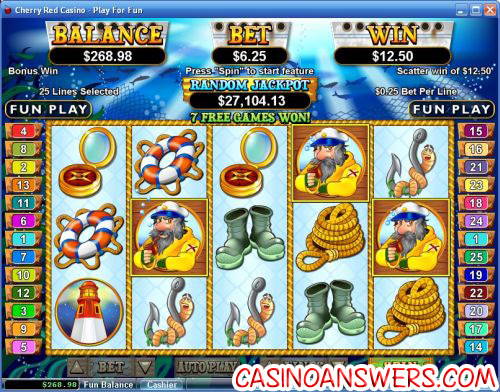 What is the best casino to play the Sea Captain slot game? There are lots of great casinos to play Sea Captain at. Two of the best are Cherry Red Casino and Winpalace Casino, which both offer excellent signup bonuses. For more details on Cherry Red Casino, please read our Cherry Red Review. Where can I play the Sea Captain flash game?